Well it is officially day three of my little Top-toberfest celebration. 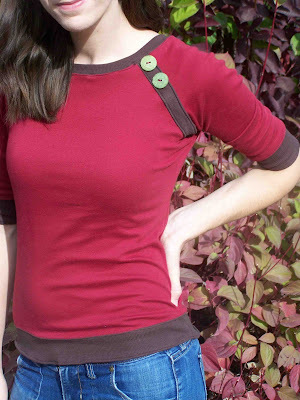 I've decided to share a little top that I call the Bands and Buttons Raglan Top. Having made so many raglan sleeve tops for Clark, I thought that it was time I make one for myself. I created the pattern for this shirt by using an existing raglan style top. I of course added a bit of length to the shirt, took in the neckline a bit, and modified the sleeve length. The most obvious of the changes would have to be all of the bands and buttons. I created a little brown band that runs along one of the side seams. I like the way that it breaks up the shirt and provides a bit of a focal point. I had to do a bit of math when modifying my pattern to accommodate the band. 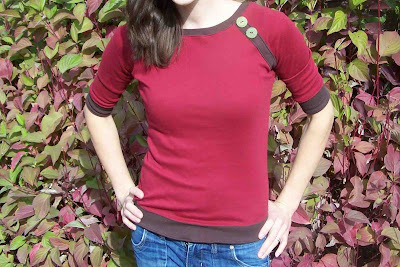 Below you can find a tutorial for adding a band to your existing raglan shirt pattern. If you haven't ever created a pattern from existing clothes this tutorial from Made might help you. If you've never assembled a raglan sleeve shirt see this post. 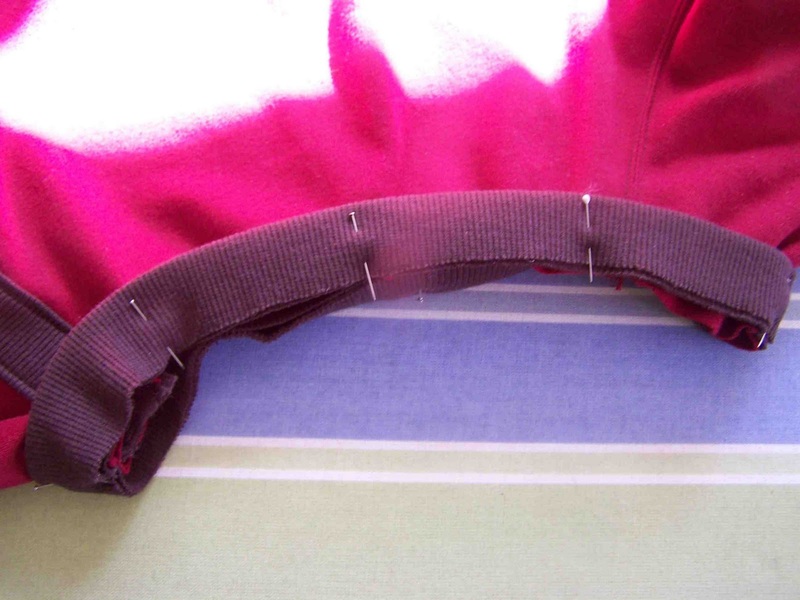 My tutorial is just to cover the basics of the shoulder band modification. I'd provide info for the waistband, but that was a bit of an experiment and I am by no means an expert. Read more below for the shoulder band details. First things first: Creating your pattern. When you are creating your pattern for your raglan shirt you are going to need to add some additional room for the band overlap. I always like to be a bit on the safe side so I usually factor in 5/8" seam allowances. Both sleeves should have 5/8" seam allowances, along with the back bodice piece. The front will have 5/8" seam allowance on one side, but the remaining side should have a 1 1/8" seam allowance. This will allow extra room for the band to be stitched along the shoulder seam. Cut out your pattern pieces. 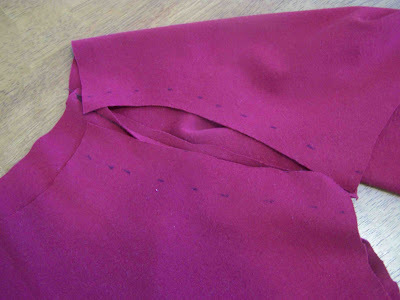 Mark your bodice along the seam side 1" from the edge, and 5/8"(or seam allowance) away from the raw edge of the corresponding sleeve (see image above). 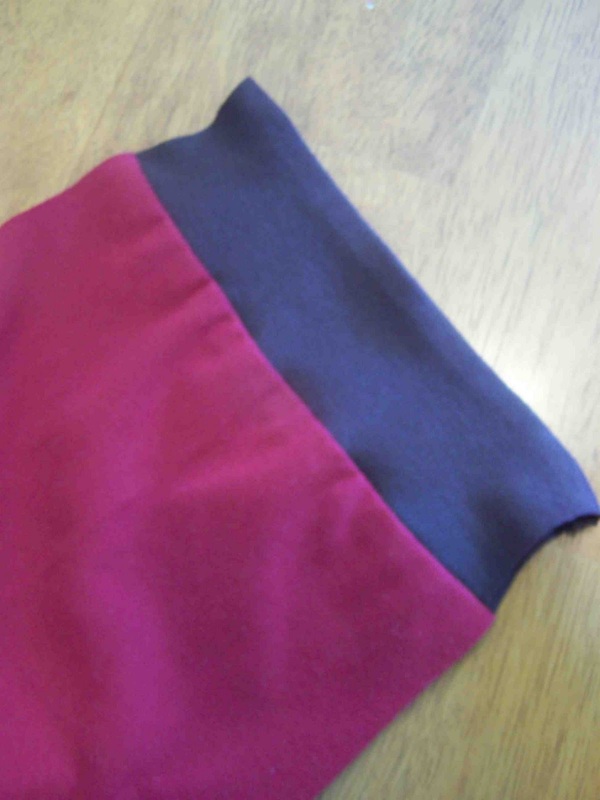 You will also need to cut a piece of knit (I used ribbed knit) the length of your shoulder seam and 2 1/4 " wide. 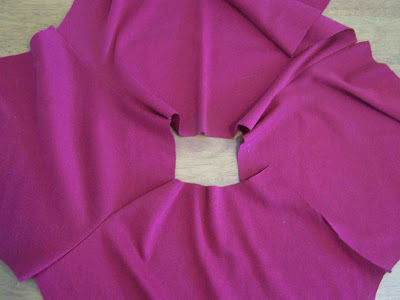 Next you will want to sew together both back shoulder seams, and the unbounded shoulder seam. We are now going to attach the band. To do so line up the band along the 1" mark on the bodice piece. Pin in place. 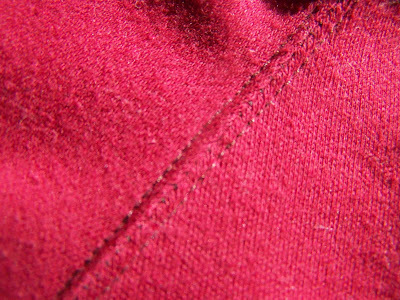 Stitch 1/8" away from the raw edge. 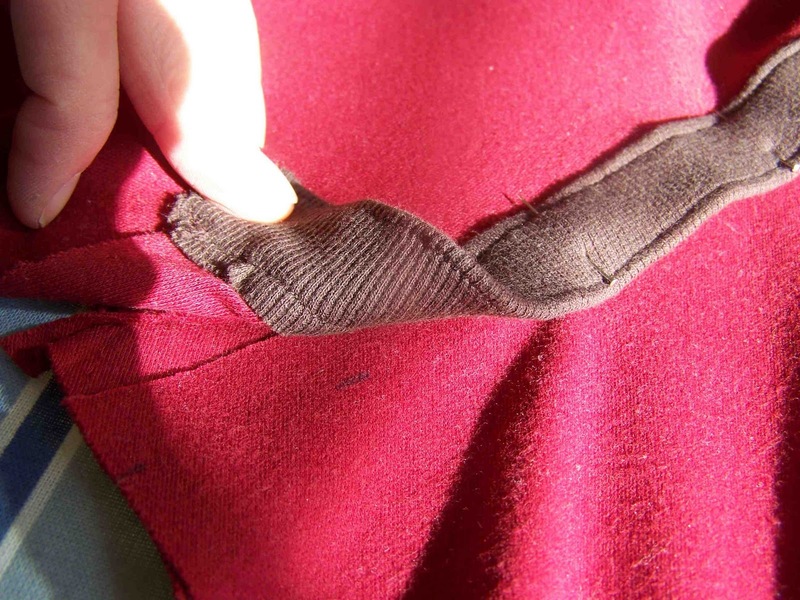 Fold the band over around the raw edge of your bodice piece, encasing your knit edge. Press. Pin in place. Top stitch 1/8" away from either edge of band, this should catch in the underside of your band. 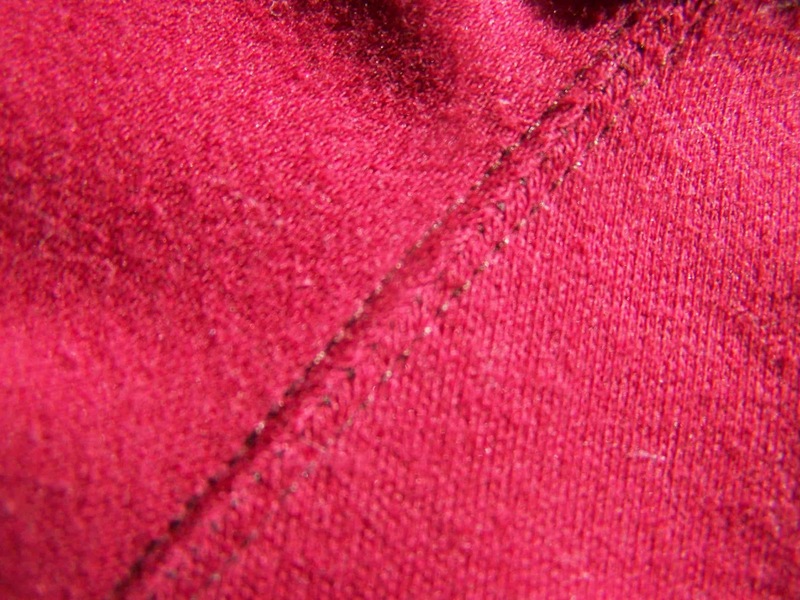 Pin ribbing so bottom (inside) seam of band lines up with the raw edge of the remaining shoulder seam. 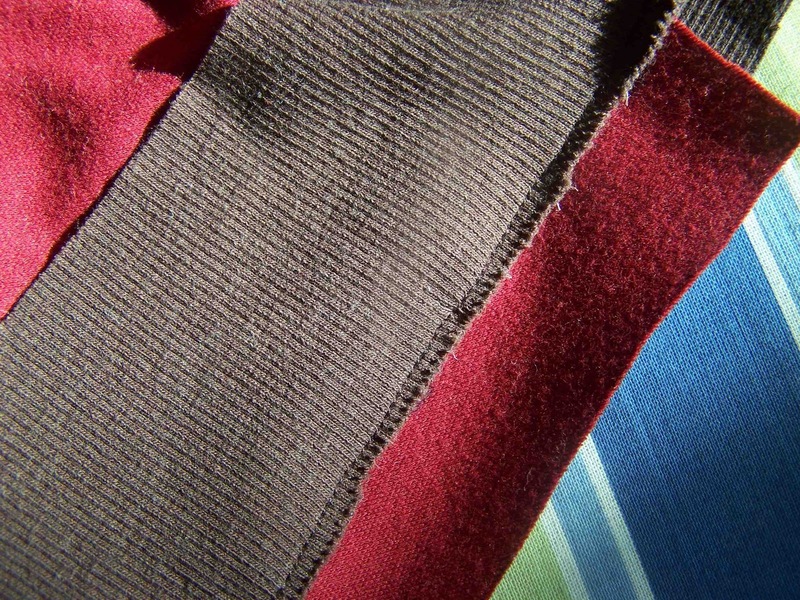 The band should overlap the marked seam allowance by 1/2". Stitch down the band on both sides, along previous stitching (1/8" from either side). 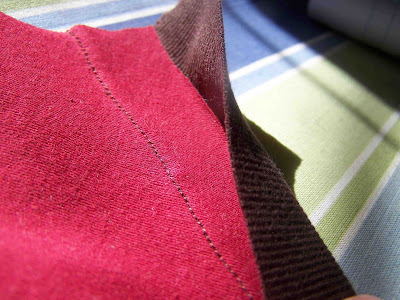 Turn your fabric wrong side out and pin the shirt along underarm and side seams. 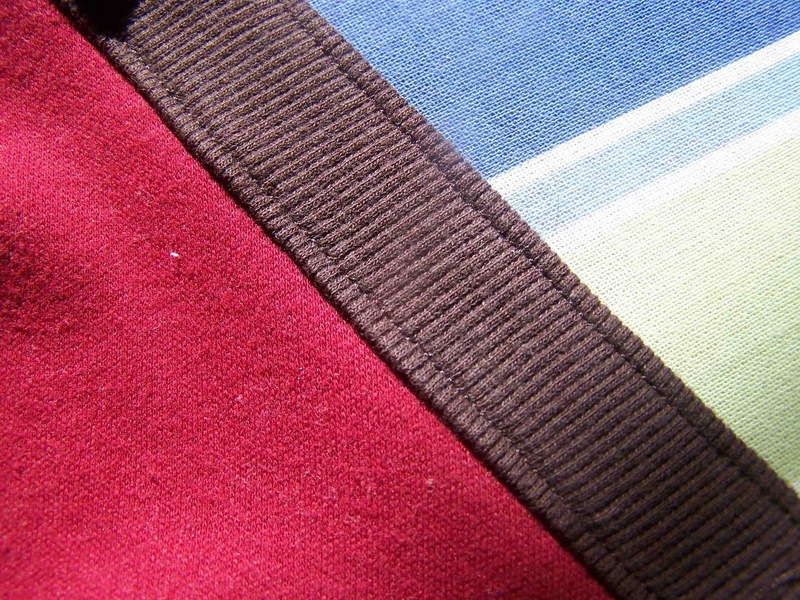 Stitch using factored seam allowance. Finish seams if desired, or trim and press seam open. Apply collar by using ribbed knit. My collar is one inch wide when attached. The ribbing was cut 2 1/4" wide, and 2/3 the length of the neckline. Divide collar and shirt into eighths, stretch collar to meet markings, pin, and sew using 1/4" seam allowances. Press. 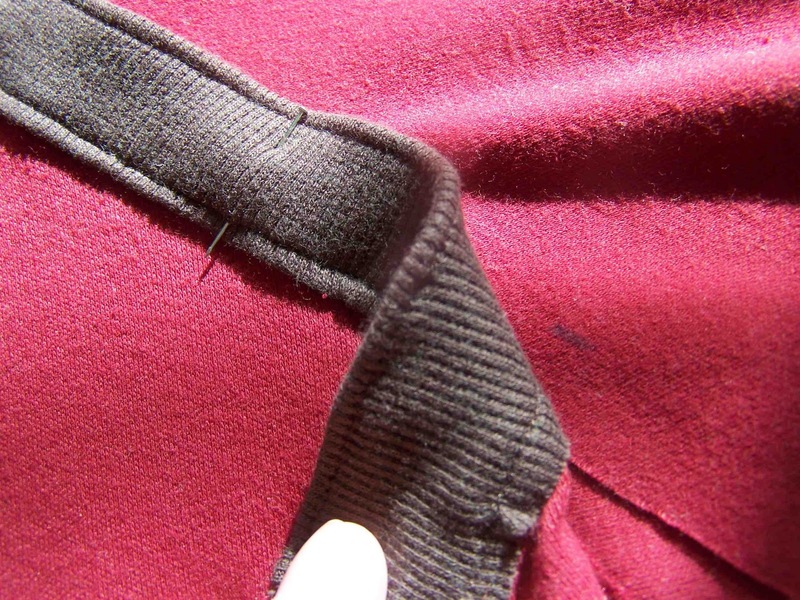 Topstitch along collar with a twin needle to secure seam. 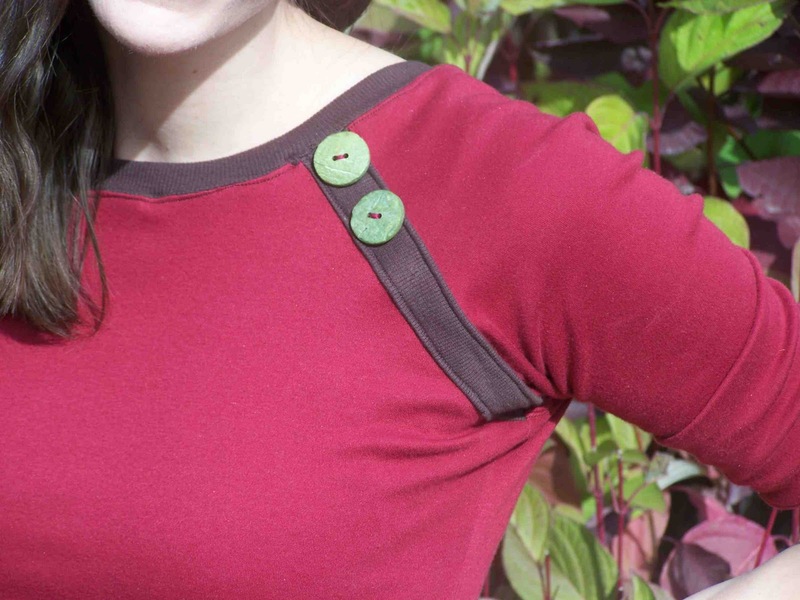 Sew on buttons along shoulder band. Note: I used a twin needle to straddle stitch the shoulder seams, arm cuffs, and collar. I applied the arm cuffs before stitching closed the underarm and side seams. The waistband can be eliminated and replaced with an unfinished hem, or a hem created using a twin needle (if no serger is available). 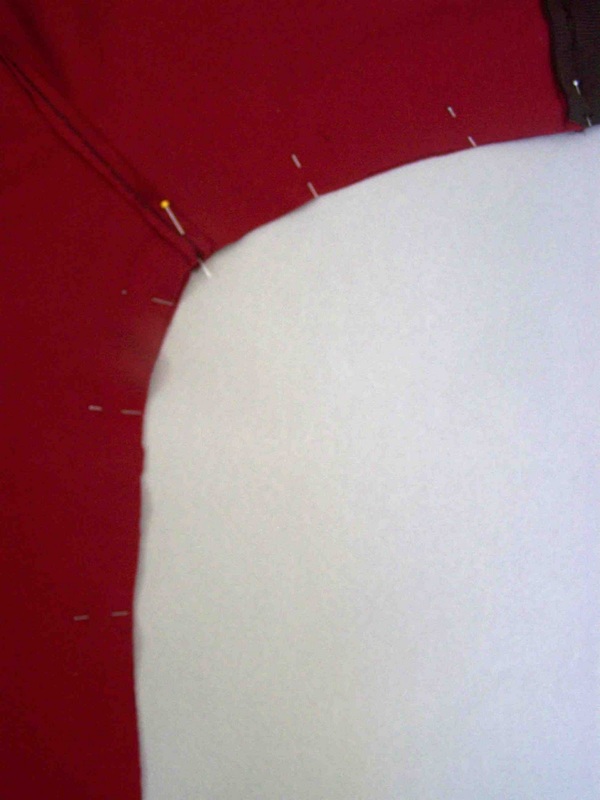 For more information on twin needle stitching go here. I'm linking up here today. Feel free to link up any tops to the Top-toberfest Show and Tell. We have some great tops linked up that I am just itching to try. Love it! 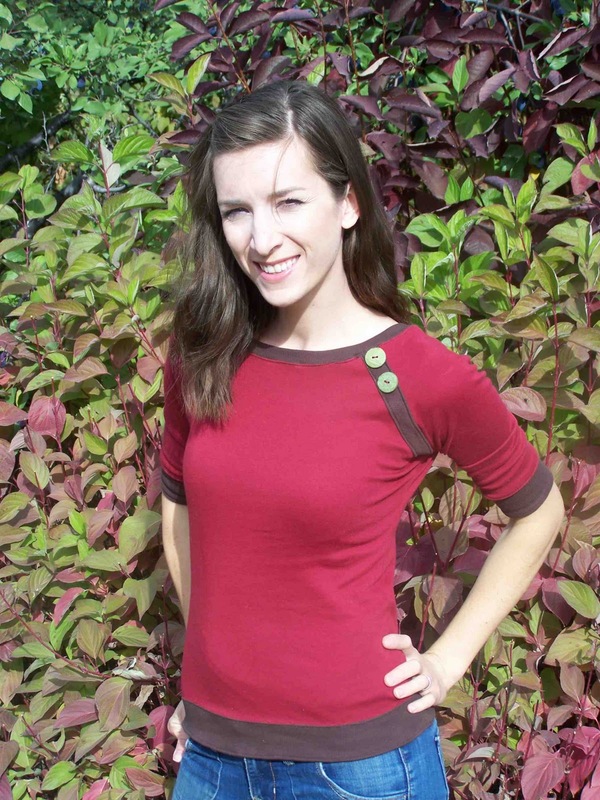 A raglan for myself is on my to-sew list as well. I love the brown and red combo, perfect. Thanks for the instructions on adding the band. That looks like the same brick red interlock from JoAnn's that I stood in line with yesterday for 15 minutes with a cranky toddler, then put back and left! I'll have to go back post-naptime someday. Very Cute! Love the raglan style! I also love putting bands on the bottoms of shirts, and have a couple more in the works! super cute! man-ANOTHER cute top I HAVE to make. Oh well! haha. Love the contrasting band! I need to find a raglan shirt that fits me so I can make this. this is so great looking! i love it! I love this shirt. I am definitely going to make one myself. Wow -it is beautiful and impressive. Love this! The fall colors are very pretty. LOVE this. I need one for myself, and those colours are perfect for me! I am totally loving this!!!! Very nice post. Thank you so much for sharing such an informative blog.